Garden tomatoes are especially prolific this year. Visiting family has helped us avoid waste by eating their way through pounds of tomatoes in various guises. We've made especially good use of the heirlooms as they ripen. Their jewel tones more than compensate for their less than perfect shapes. I love the way they look in a bowl. This is my nearly nine year old grandson, Drew. Drew likes to delegate. His mother and I are his sou chefs. This tomato salad was his contribution to the family table. Drew spent a good deal of time in the farmer's market selecting the tomatoes he wanted to use for his salad. Those we are growing in the garden didn't meet his standards, so we had no choice but to outsource. Drew's creation is wonderful on a salad plate, but with the addition of a little vinegar it also makes a terrific bruschetta. This is his recipe as it was shared with me. Combine all ingredients in a large bowl. Chill for 1 hour. Yield: 6 to 8 servings. The topping for this bread is just delightful. It would also be wonderful on a thin pizza crust or ready-made lavash. It's really easy to do. I'm including a recipe for the focaccia bread along with the topping. The bread, too, is wonderful. 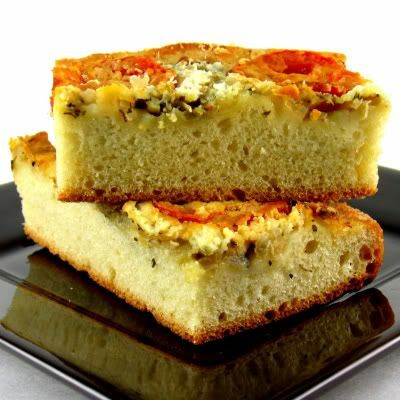 The focaccia can be served alone as a snack or combined with soup and salad for a hearty meal. Mix yeast and water in bowl of an electric stand mixer until yeast dissolves. Add olive oil, salt and flour. Using a dough hook, knead dough for 15 minutes. Form into a ball and transfer to an oiled bowl, turning to coat all surfaces of dough. Cover and let rise until double in bulk, about 2 hours. Using fingers, spread dough to edges of an oiled baking sheet. Mine was a 9 x 13-inch rectangle. Pinch edges to form a crust. Cover and let rise again until doubled in bulk, about 2 hours. Heat olive oil in skillet over medium heat. Add onions, oregano and basil and saute until onions are very soft. Set aside to cool to room temperature. Preheat oven to 425 degrees F. Spread onion mixture over dough. Sprinkle with 3/4 of cheese. Top with tomato slices and remainder of cheese. Bake on center oven rack for 35 to 40 minutes, or until golden brown and cooked through. Yield: 12 servings. Recipe courtesy of the North American Olive Oil Association. This recipe is being linked to Outdoor Wednesday, an event sponsored by Susan at A Southern Daydreamer. Oh my, the focaccia looks so delicious! I got to make them! Zach and Drew are such a good helping hand...he he! They break anything??? He sure would be a good chef. This is wonderful! Thanks for sharing. oh wow I think I could eat that entire bowl of tomato salad. and that foccacia looks utterly amazing!!! i too love heirlooms and am SO happy that they are in season right now. MLS, nothing in the kitchen! We did, however, have issues with a remote control. They just left a few hours ago. The house seems deadly silent. I will miss them. It's been a wonderful 2 weeks. This Focaccia is outstanding as well! Tomatoes are just so wonderful! 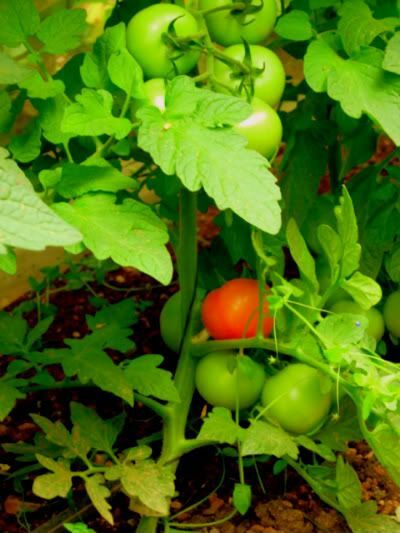 Oh, there is nothing like a garden tomato. Wish I had some right now. Your salad and focaccia looks absolutely delicious. Can't wait to try them.... and thanks to Drew too. 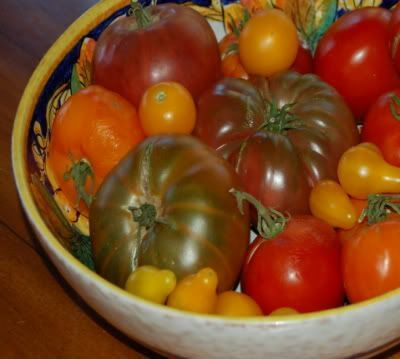 The bowl of tomatoes is just gorgeous! Oh my, does this focaccia look fantastic! I am most definitely trying this amazing topping recipe. Wow! How thrilling that both grandsons are so into the food! The tomato salad looks so fresh and lovely and good for you! Drew is growing up so fast in comparison to the picture in your sidebar. He's a handsome young man, and he can COOK!! The focaccia looks perfect. I must try this. What a yummy looking salad. And that focaccia bread photo looks good enough to take a bite right off the screen. Drew's a handsome young man & looks like you've got a little chef in the making?! The focaccia looks really, really good & tasty. This looks beautiful Mary. The tomatoes really set this focaccia apart. I am a focaccia fan and am always looking for variations! How did I go from despising tomatoes as a child to LOVING them! Cheers for Oma in teaching these kids how to cook and be creative! Their future wives will love you!! I made pizza dough yesterday and Drew's topping sounds so much better than what I had planned. What fun to be in the kitchen with your grandson. It doesn't get much better than that. I love anything with tomatoes! YUM! Thanks for sharing recipes for the love apple! i know i say this about a lot of your food, but geezee, this one looks SO GOOD. i love focaccia, and this one looks so tasty! its easy for focaccia to be bland and too salty or a weird texture. i had a bunch of bad focaccia over about 2 months and just stopped getting it .. i guess i forgot how GOOD and good one could be! I love tomatoes. We have a weekly vegi deliverey from a local organic farmer..., tomatoes have not (yet) been a part of it though. One of my favorite "munchy" meals is focaccia and steamed artichokes. Simple and perfect on a hot summer day with a big glass of lemonade or sweet tea. Sorry to see your family has left, but what memories you'll have! Mouth watering! Your heirlooms are lovely and Drew is quite clever, isn't he? 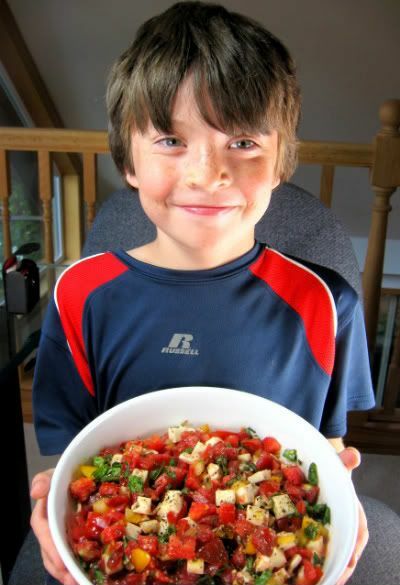 Looks like Drew picked out some perfect tomatoes...love the looks of this salad! And the focaccia looks amazing, Mary..it's bookmarked1 I've got to try this....thanks! Mary, I have to make that this weekend..it looks wonderful, and I have my pathetic little crop of tomatoes to use. Drew certainly looks happy with his creation and I expect to see him on his own cooking TV show shortly:) A chip off of his grandmothers block for sure! I have been looking for that recipe for the tomato salad. My fil has been bugging me to make some salad like this. Great job, Drew, for wanting to learn to cook! Oh, the tomato salad sounds wonderful. We have tons of fresh, garden tomatoes this year and I look forward to trying your recipe. Thank you so much for sharing. YUM! Love the sound of both the salad and the focaccia. 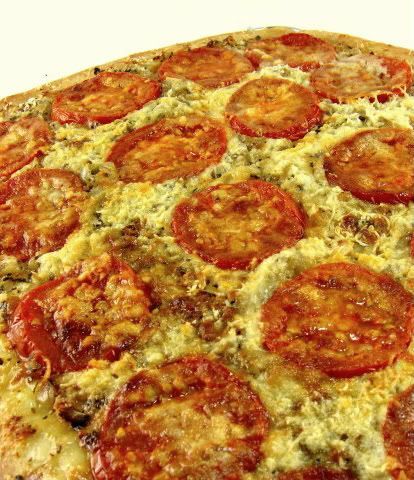 Great use of those gorgeous tomatoes. I love your post! Thank you so much for visiting me on Outdoor Wednesday! The tomatoes look so delicious. I love this post. The recipes sound delightful...o, and I have a grandson, Drew, too. We celebrated his 19th birthday last night!! It is a pleasure for eyes and taste buds as well to scroll down your blog. Thank you for visiting mine. I wish I could hire you as my cook! Wow! I am so impressed by Drew's recipe, and his insistence on choosing his own tomatoes. Plus, his resourcefulness in out-sourcing some of the work! Smart guy. He's a keeper. I just had a Jersey tomato sandwich for lunch. Jerseys are our favorite summer tomato. Dear dear Mary, as usual you make me hungry!!! It look so good - I have been away on holiday so Now i have been looking around, lemon chocolate cake, red car, grandchildren helping you out, lemon cake Irish butter - nice to see you again!!! Do you know the English name for the yellow mushroom I found in the forest - the a good and everybody eat them in Sweden. Yummy. Cute grandchef. I just found your blog today. Yippeee! Beautiful photos and delectable recipes! Oh that all looks so yummy! How delicious the focaccia looks. Thanks for all of your comments! Everything here looks delish! Our tomatoes are late this year on acct of a very wet spring. Soon, I'll have too many to know what to do with! Land oh goshen...that Tomatoe salad with Focaccia bread sounds divine. Thanks for stopping and leaving a comment. Thanks for some really good sounding recipes. I do not do much cooking anymore, but what you prepared looked awful tempting. Tomatoes is one of my favorites. Happy you had time to visit today. I'm going to make Drew's tomato salad! One iron chef in the making. (setting a standard) I am drooling over your focaccia. P.S. I love your header, it has a "welcome" delight! Thanks for your nice comments. Everything looks so delicious Mary. I wish ours were prolific this year. I am so looking forward to having fattoush! So great that your grandchildren are so interested in cooking. Looks totally delish. I love that your grandson is a little foodie. His salad looks incredible and so does your focaccia - wow! Oh sure, dangle those beautiful tomatoes in front of me when I have been moaning about my lousy crop of heirlooms. Thanks for the advice. I did add the manure to the garden early in the spring and it has no smell so I think it was pretty well rotted. I just think the grower chose the wrong varieties for their plants. WOW! I made this recipe a few days ago and it was a huge hit!!! I loved it!! WOW! This is a really Great recipe! I made it a few days ago and it was huge hit!!! WILL make again!